My Honeyman is the bombdiggity. Whatever I can dream... he can build. Right now we are in the middle of building a beautiful... oh, but wait... that's another day's post that you'll just have to wait for. 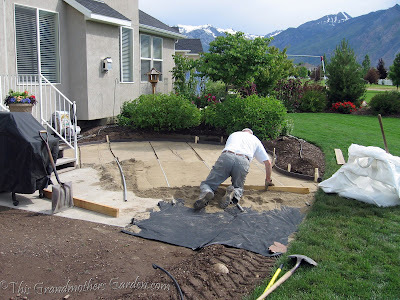 Today we are sharing Part One of how we built our gorgeous FLAGSTONE PATIO... totally by ourselves. Why pay someone else to do what we can do together as a family? Family Projects give us an opportunity to work together shoulder to shoulder. Together we learn valuable attributes such as patience and respect for each other and staying with a job until it's finally done. And when our project is completed, together we feel the exhilaration of building something beautiful. These are the ties that bind us into a Forever Family. "As with most of our DIY projects, the planning, preparation and purchasing activities took a good deal of time, but were critical to the beauty of the resulting patio. For those eager to start building your patio, don't be tempted to rush ahead here! • Where to locate the patio? We had already decided this long ago, reserving a space for the patio in our master plan. • How large should it be? Smaller would have been easier and less expensive, but we wanted a place to live outdoors and entertain, and so needed some substantial space. We ultimately laid 750 square feet of flagstone, requiring about 4 tons of 2 inch thick flagstone. • Shape? 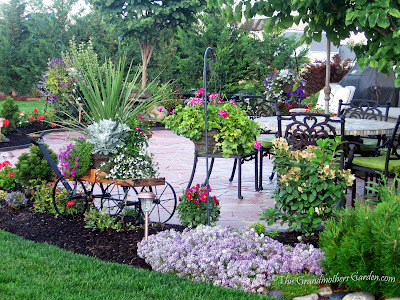 We love sweeping curves in our garden, but a square patio may fit your landscape just as well. With the answers to these questions in hand, it was time to prepare the foundation. 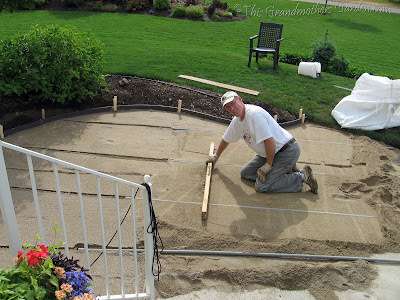 This involved creating the proper grade, outlining the shape with bender board, covering the ground with weed barrier, and then leveling it with sand. • Preparing the slope of the subsoil is CRUCIAL! It must slope slightly away from the house in order to provide proper drainage. A square-mouth shovel and lots of patience will be required to get it right. • We next rolled out weed barrier fabric across all the exposed soil. We actually divided the project into sections for this phase of the construction. • Finally, we spread a 1 and 1/2 inch layer of masonry sand over the weed barrier. The more level you can get this layer, the easier it will be to level the flagstone later. Tip: we first laid lengths of plastic pipe in parallel every 3 feet or so, then spread the sand between the pipe using a shovel. A length of lumber was then used to scrape or screed the sand. Once the sand was level between pipes, we carefully removed the pipes to continue the process elsewhere. Just ignore the impressions where the pipes were removed—they won’t matter once the stones are placed." The morning our sand and stone arrived was a perfect day. I was apprehensive that the bobcat could carry those heavy pallets across my lawn without causing major damage, but it all worked out. Two tons of sand and four tons of stone. The bobcat did leave his tracks in my Honeyman's well prepared and leveled surface, but that would be a quick fix. With the sand's arrival he was anxious to try his PVC pipe idea to aid in the leveling of the sand, so he got right to it. It worked like a dream! *Notice the small concrete pad laid by the contractor when the house was built... their idea of a patio. We just worked over this. Actually HE works like a dream... still chugging after all these years. At this point my job was to add color to the grounds to keep his work space gorgeous... keep in mind it was June and I had no intention of letting everything else slide while we installed our Patio. 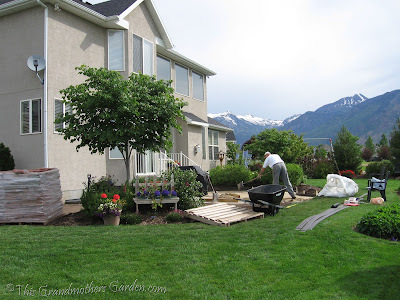 This was still planting time in our zone 5 gardens and I had lots to do. Each of our eight children and our grandchildren would be home in August and our plan was to have a family picture taken in the gardens... so everything needed to be perfect. Next post... Laying the Stone. This was challenging and labor intensive, and we all took part in this phase. Think of a giant puzzle to assemble! So true that family projects teach us such wonderful lessons on how to act together in a more loving way...if my husband and I can get through a project we count our blessings and learn our lessons...of course I rely on him more these days and he really does not like the yard work...it is sheer love for me that propels him into the yard work...I know I am lucky...but my honeyman has to be prodded a bit as well to finish or he conveniently finds other things to do and people to socialize with...oh well I am far from perfect with the inside work...can't wait to see the next installment.. Your dear husband is much like mine; we have worked together as a family on so many projects I've lost count. Your patio is so beautiful; it's obvious it was well-planned and built with love. Lovely to see ye getting stuck into a bit of stonework. A very satisfying task for sure. Wow, very impressive. I can't wait to see the end results. Working together can create such a sense of accomplishment at the projects end, though there can be some tense moments in the working phase. I'm not a fan of patios. I inherited mine from the previous owner. I takes ages to de-weed it because I don't use chemicals. I'll be interested to see how Mr.Honey deals with the gaps in between the flagstones. Oh, Carolyn I need a honeyman. LOL! It is so nice to have a fella that knows how to use tools.LOL! My Dad was like that. He never was good in school and books but he could build anything or work on anything with his hands. Carolyn, I can see that careful planning made all the difference in this project. 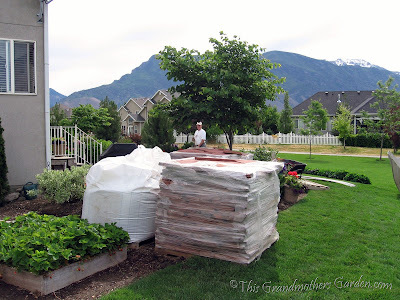 I have a flagstone patio on my wishlist too. Thanks for the tutorial. I love great pictures and lots of detail in tutorials! Actually, Kate, we were just in Park City last week shopping. He would have much rather been at your place sprucing it up. Next time? B-a-g, there is a great tip coming up for those gaps and weeds. Stay tuned! Thank you all for your sweet comments. We're happy to share what we have learned. I love seeing how other people who are perfectionist do things the right way! I am unfortunately one of those that rushes right in and then it takes ages to "fix" things afterwards. what a beautiful job. This post is coming at such a good time. We are about to lay a patio too and have been stymied by time and method. I think your space is beautiful and will come back to check out the rest of the posts. What a nice guy Honeyman is to work and let you plant! Honeyman let me do the planting to allow him to concentrate on this phase without my bugging him. Leveling the sand was essential, and there was a bit of anxiety that this method was actually going to do the job. Thankfully, it worked like a charm! What a great series! I look forward to the conclusion. My honeyman has been wanting to do a DIY patio for a while now, and I think I will have to share this post with him for some motivation. Please just let me know yes or no so I can link to your blog on my post. I want to publish my list by friday. I kept getting distracted from the details of the post by the spectacular views of the mountains from your patio-to-be. So funny, my husband is going to start doing guest posts on my blog. We are just waiting for a product to arrive that he is going to test and write about. My husband couldn't handle a stone patio though!! !